Today’s musical choice was a damn good one! 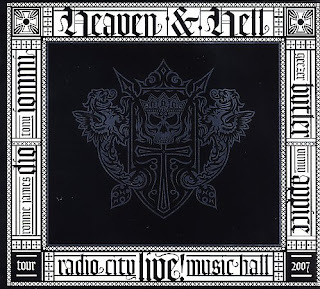 Heaven & Hell are basically a reconstituted Black Sabbath and this live recording serves as sort of a “greatest hits” collection. Growing up as an awkward lad with a “weird” sense of humor… I usually had no girlfriends. I just more or less stayed at home listening to music. And I forgot how much I enjoyed Black Sabbath during the Ronnie James Dio years… Albums like ‘Mob Rules’ and ‘Heaven And Hell’ spent some hours on my turntable. You know, that ancient device utilizing a diamond stylus that picked up recorded sounds from the grooves on a piece of vinyl… Don’t remember them? I had forgotten songs like “Children Of The Sea”, “Mob Rules”, and the powerhouse that sticks in your brain kind of song… “Voodoo”. It’s a damn good album and I can’t wait to see my DVD version of it! Anyways… I found something interesting driving in to work this afternoon. For those of you who wanna get ripped while getting the healthy antioxidants found in Green Tea… Check this out. That’s right! You can get bed-soiling drunk while protecting yourself from cancer, easing symptoms of rheumatoid arthritis, lowering high cholesterol levels, keeping cardiovascular disease in check, and boost your immune system functions. My friends… It is indeed a great time to be alive! Is there room for Silk to put out their own soy-based cocktail? Is Ovaltine working on improving the nutrients found in Mudslides? Can we develop alcoholic cheese that covers our nacho chips? What about getting Ranch dressings with at least 6.6% alcohol? I say screw stem cell research. Lets put our money and resources into developing healthier ways to consume alcohol! Once our nation becomes drunk on alcoholic Green Teas, Ovaltine, Soy milk, nacho cheeses, and Ranch dressings… We won’t care about such silly breakthroughs making diseases and afflictions obsolete. Long live alcohol related health foods and drinks! And here’s a nifty little picture from The Onion… NFL’s Most Popular Jersey for 2007! Sorry this update is so short… I’m still feeling the tiring effects brought on me by this past weekend’s Summertime Brewsfest. 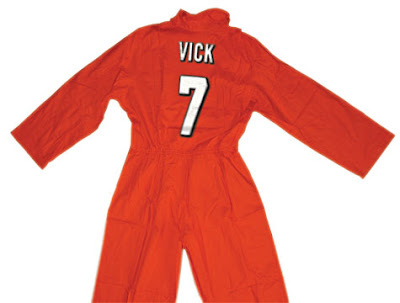 I've also seen the Falcon #7 jersey with "Con Vick" on the back as well as Michael Vick chew toys for dogs.